Now you can officially share Youtube video updates with friends on Twitter and Facebook. For every videos uploaded to your Youtube account, update for the same will be posted on your Twitter and Facebook timeline. To get started, login into your Youtube account. 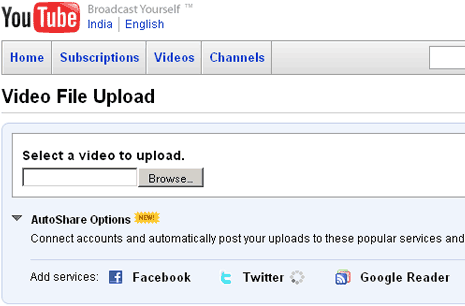 Then click Upload > upload video file to see the following settings page with AutoShare options.